Make sense, use your senses, service learning, civic engagement, responsibility, ethics: For a couple of months now, these buzzwords have wandered around Karlshochschule, but still many do not know what it is about. So here is the attempt to unravel some of the doubts, as this is part of my job. I started in October at Karlshochschule to coordinate this project. My name is Maren Baisch and going back to a university after many years in development cooperation was an exciting experiment. From this professional background and also through long years of volunteering in a grassroots democratic organization I am – luckily – used to participatory planning and implementation, a necessary tool for this project. So What Are We Doing in the SENSE Project? The idea: SENSE uses the service learning approach to foster values and ethics. We give students the opportunity to experience practical elements in their study program that help them to reflect on themselves, social relations and their own scope of action, an important step in their personal development. So the objective is to support students to embody ethics and responsible behavior as a mindset. The project: To bring that idea into reality, we work on several levels: we try to bring the ideas of SENSE broadly into the university and we bring these ideas very practically into the study programs of the Karlshochschule. 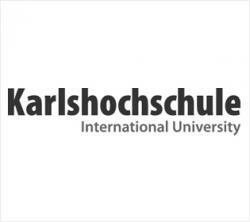 For the first part we aim at strengthening the profile of Karlshochschule as a university that focuses on responsible management. Again, an abstract thought. One nice example to illustrate what that means was one of the events we organized: We used the International Volunteer Day in December 2018 to showcase the civic engagement of students, staff and professors of Karlshochschule. They prepared posters, videos, pictures of their own volunteering story, additionally we painted a picture together to illustrate what volunteering and civic engagement mean to all of us and had a vernissage with the opportunity to exchange on experiences. Our role is thus to advocate for civic engagement and enable a discourse between the different stakeholders. The second and main part of our project is more tangible: we integrate elements of experiential service learning into all study programs. Hence, we elaborate different modules to be implemented in the course of the studies and integrate some of the basic ideas in the already existing modules for the first and second semester. At the moment we are in a high workload phase as all these modules will go into a pilot phase next semester. Exciting! 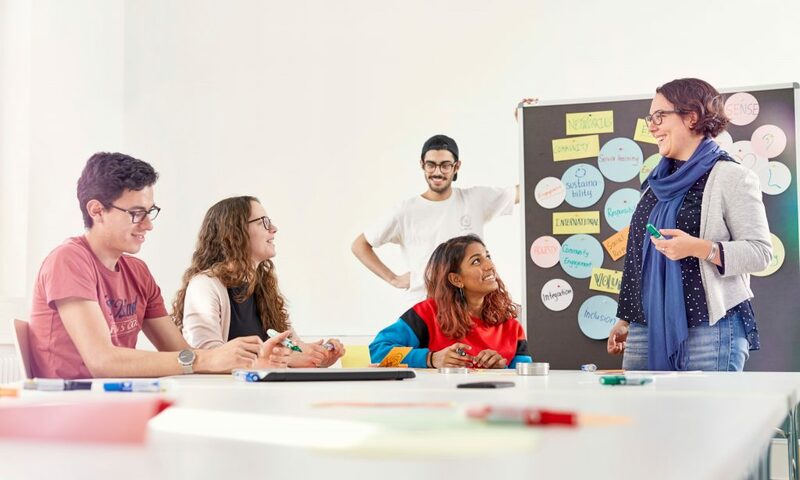 In the third or fourth semester students participate in groups in Social Impact Projects in Karlsruhe. Over the course of one semester they support an NGO or initiative and work on a concrete task. Before the start they get some input on project management and the work in the social sector. Throughout the project they are accompanied by coaches. The core of the learning process is the reflection phase with a debriefing and presentation of results along with evaluation of the learning process. During their semester abroad students are encouraged to do a second, international project in their host country, to add on an intercultural element and the experience of working individually on a project. We cooperate closely with our International Office and the partner universities in the realization and accompany students with preparation workshops, digital coaching and a reflection phase after returning back to Karlsruhe. The final step is a “Learning through teaching” experience, where students work with schools on projects or the topic of civic engagement. After a didactics training, they prepare workshops for the local schools. Here again the reflection part is crucial as this module helps to transfer passive knowledge into active knowledge and gives them the opportunity to learn how to guide others. All three modules will have digital elements, as the nexus digitalization, ethics and learning is the fourth component of the project. The most exciting part of this work is actually that the students are not seen as consumers and get the final product, but we involve them in all steps, through brainstorming sessions and digitally, so that they can shape the modules according to their interests and needs. We communicate these with partners for the project in order to make the project beneficial for all sides. This very participatory approach is already the first step towards responsibility for the own learning success. We will update you here on our experiences with the pilots. Learn more about the SENSE project!